This project was created on 03/21/2017 and last updated 2 years ago. In more remote areas it is sometimes possible to get good cell phone reception by standing up high on a roof to get &apos;Line of Sight&apos; with one of the local base stations which may be as much as 10 miles away or more. Climbing up a ladder onto a roof to make a phone call or check your Facebook profile is not particularly convenient, especially in high winds and rain or snow. A better option is to use an antenna to route the signal to the inside of the nearby building. In theory, if the antenna itself was powerful enough and if the cable was made of really thick copper bar, there would be no need for any extra electronics. In the real world a small amplifier and filters are required, especially on the weak signal received from the base station. 4G signals are highly directional and getting them to go inside buildings can be tricky, particularly where the overall signal is weaker. This device captures the &apos;good&apos; external signal and redistributes it to the inside. The 4G signal from the local base station is captured using an external logarithmic Yagi antenna mounted high up on a pole. The external antenna is pointed directly towards the base station and needs to have &apos;line of sight&apos; which means that there are no major obstacles such as large buildings, hills and trees in the way. &apos;Line of sight&apos; does not mean that we have to actually see the base station, it&apos;s more of a theoretical term and really just means &apos;no major obstacles&apos;. 4G signals generally have good penetrating ability but do not like going around big objects. The signal then travels through a low loss coaxial cable and is routed into the Rx (791 to 821 MHz for my network) port on the duplex band pass filter (BPF) on the left hand side of the diagram above. Following the red arrows in the diagram, the signal is routed into a low noise amplifier (LNA) which can be configured using the Arduino in three possible ways: &apos;Off&apos;, &apos;One LNA&apos; and &apos;Both LNAs&apos;. Selecting both LNAs can provide 37.5 dB of gain with a noise figure of just 0.55 dB. Next in the signal path is the variable gain amplifier (VGA) which is controlled by the Arduino using the SPI bus. This component actually contains two amps cascaded together giving a total possibility of four cascaded amps in the whole Rx part of the circuit. The VGA is capable of adding another 32 dB of gain to the signal and can handle up to 1/2 watt of power with a noise figure of 1.5 dB. Since the circuit can pick up some unwanted interference, the signal is now routed into a second identical BPF which then connects to a plate antenna located inside the building. The BPF filters are &apos;duplexed&apos; which allows the same antenna to be used for Rx and Tx simultaneously. The strong signal transmitted from the cell phone is typically about 1/4 watt when far away from the base station and weaker when close to the station. The circuit has a VGA for transmitting the cell phone&apos;s signal back to the base station but this is not currently used as transmitting noisy or very strong signals to the base station can damage the network. Instead, the duplexer is used to monitor the strength of the cell phone&apos;s signal via a &apos;Received Signal Strength Indicator&apos; (RSSI) chip which can be used to check that network compatible phones are present. Compatibility is determined by the actual BPFs selected as they have different frequency bands for each network. LimeSDR 'JTAG' adapter for connecting SPI bus to Arduino 3.3v Due. The pinout connectors on the LimeSDR are extremely small and almost impossible to get a reliable connection with 'bare wires'. The only sure way is to get this PCB made. PCB design opens with 'Design Spark' software. All Rx Components now Working! The effectiveness of the design is given by the uploading and downloading speeds of the cell phone and in the last test, with all the components working as they should do, uploading was at 2 Mb/sec and downloading was at 12 Mb/sec with a theoretical maximum of about 7 Mb/sec and 38 Mb/sec, which suggests that there is still some fine tuning to be done at some time in the future. Nonetheless, using this device inside a building improved the upload speeds by a factor of 2x and the download speeds of about 10x. Just a quick note about 4G speed testing - The cell phone and the network communicate systems data with each other in both directions and the network will transmit actual useful data to the phone in increasing degrees of complexity depending on the signal quality that the phone receives. If the phone detects poor signal quality it will tell the network to give it data in a simplified format which in turn means that download / upload speeds are diminished. The next step in the project would be to analyse the circuit with a Vector Network Analyser (VNA) to fine tune it and make sure that signal is not reflected back into the Rx antenna on the Rx side of the circuit. Another idea would be to upgrade the PCB stack to a better grade of material which would improve parasitic capacitance. At some time it would also be nice to be able to get the Tx part of the circuit working but currently I can&apos;t test this without my network&apos;s permission. After several weeks of trying to solder the RF amplifier chips I eventually concluded that the techniques that I was using to accurately position the chips was not up to scratch. I tried microscopes, magnifying glasses, magnifed eyeglasses that you jam into your eye socket - all to no avail. Using the square drawn on the silkscreen was hopeless as the board manufacturer could, or would, not print the silkscreen accurately and this route proved to be a dead end. I did elongate the PCB pads slightly so that they were visible, but the pads on the chips themselves are not visible at all so there was no possibility of lining them up at all - another dead end. After a while, just by chance, I was able to get the two chips, the LNA and VGA working together by connecting up different boards and when they worked, they worked really well. This was nice as it effectively ruled out any incompatibility issues. Unfortunately, the laws of probability did not allow me to get the two chips working on the same board ..... Not yet anyway. It&apos;s worth noting that trying to use a microscope to look at all the corners of the chip at the same time will inevitably be inaccurate due to the marker squares being partially obscured by the chip, particularly severe if the chip is quite tall. In an attempt to win one of the top 5 Hackaday prizes I&apos;ve managed to tune a repeater to the Verizon network on band 13 which should, hopefully, work in the USA. I did test the device using the LimeSDR as a signal generator to check that the band filters etc were working properly and ...... all seemed fine. On this version, there is an AD8218 RSSI chip on the base station Rx pathway which picks up Tx from the mobile phone. Holding my IPhone 7 about 400 mm away from the plate antenna and uploading video to YouTube, I&apos;m getting about -5 dBm max RSSI and holding the phone right next to the antenna gives +10 dBm which is as expected, so it obviously works! Two more band 13 prototypes need to be built up and all three sent to the USA for appraisal. Better start warming up that soldering iron! I thought it would be a good idea to do a speed test using my cell phone and compare it&apos;s performance whilst using the cell phone repeater in simplex mode and not using it at all. The result was a decrease in latency from 90 ms to 60 ms and an approximate 6 times increase in download speed! The amazingly flexible and useful LimeSDR is now rigged up with sliders and rotary pots, a TFT screen and bolt on Arduino Due, hiding underneath the green custom made PCB. 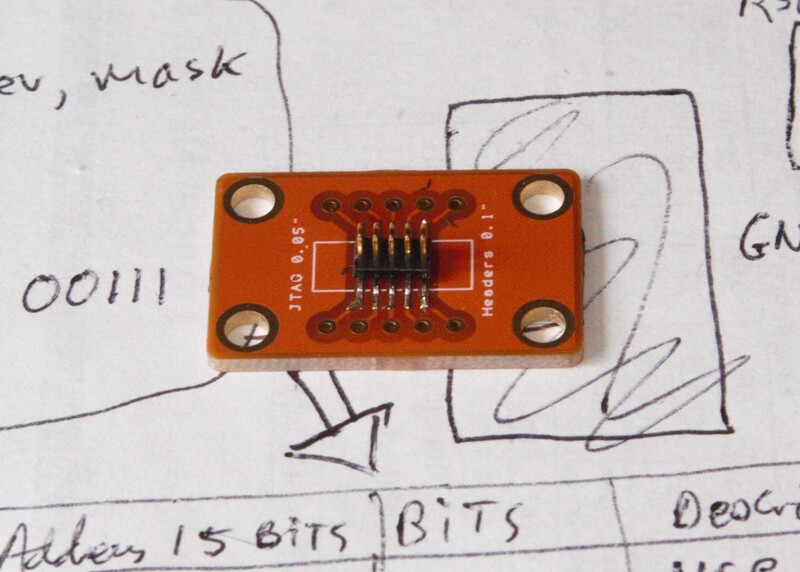 The Arduino communicates via the SPI bus through the FPGA using a special file to re-program the FPGA and enables the Lime to be turned from being a 4G repeater into a frequency hopping/sweeping signal generator within literally 5 seconds. I think I can even put 12 LED indicators on it which might look cool? I need a signal generator to test my homegrown transceivers on band 13 which is what Verizon uses in more remote areas in the USA. Hopefully this version fixes the voltage supply to the LNA controls by incorporating a simple voltage divider to get exactly 2.5 volts onto the chip. Eventually I should find the one resister to do the job as this will save power, but this is not important at the moment. I&apos;ve also added the option to use a RSSI on the phone Tx, just after the band pass filter, which can be used, amongst other things, to confirm that there is a compatible cell phone in the near vicinity. If the phone is detected, it can illuminate one of the spare LEDs to re-assure the user that there is some functionality. The RSSI is connected to the main RF line via a small coupler chip. I&apos;ve also got rid of the toggle switch on the power line and replaced it with a more compact slider switch and put it in the correct position, not way off at the top right hand corner. Hopefully this version will be free of any critical errors. Even with my manual PNP machine, it took a gruelling 6 hours to populate this board below, taking great care to make sure the exact amount of solder was smeared onto the PCB before placing components ..... and still one of the main chips did not work! Thankfully, there are 4 &apos;intercept&apos; points that make the gadget really easy to de-bug and, yes, the VGA worked really nicely on Base Tx frequencies, even though the LNA was bypassed. It&apos;s been a slightly frustrating couple of days, but I did discover 2 fairly serious errors, one of which I corrected with 2 pieces of bare wire. The other mistake was to try and control the LNA&apos;s using 5v instead of the recommended 3v - obviously I missed that somehow! Maybe this is why the LNA did not work, rather than bad soldering? Strangely, it did work on the previous incarnation with 5v. No more work has been done on the LimeSDR this side of the Atlantic although Axeman has picked up my limesuite band 20 .ini file and made certain improvements to it in the USA. In preparation for creating a Verizon band 13 version, I managed, with the help of Rickardas Jonaitis from Lime Microststems, to create an Arduino controlled signal generator using the LimeSDR. There is no band 13 in the UK and so frequencies have to be generated artificially to test the circuits. The pressure is now on to try and create 3 working prototypes for the Hackaday 2017 finals with the chance to win $50,000. Two months to go! In the meantime, a short video is being prepared to clarify what the project is about and what the possible solutions are for the BT hackathon final. The actual project challenges seem to be changing fairly rapidly as new information is uncovered or old barriers are pushed through. Currently, the challenge seems to be &apos;how to safely transmit to the base station without making it crash&apos;. Apparently, gleaned from an expert in the realm of repeaters, noise is a big issue and trying to up convert and down convert should be avoided if at all possible. Maybe simplicity is the answer after all? Version 1.2 goes to Elecrow PCB service for manufacturing tomorrow. Another 4 layers of abject confusion goes to Shenzhen, hopefully actually correcting a couple of mistakes found in the previous simplex version. Upon re-reading the datasheets for the amps I noticed that through holes are specified for thermal dissipation which should also make it easier to solder the chips, which seemed to me to be floating on a big bubble of solder on the central pad, not allowing the edge pads to make reliable contact. Hopefully that drama is over! Another concern is will there be interference between the two neighbouring circuits? I guess we&apos;ll find out in about 10 days time when the boards come back to the UK. After a few initial spikes, the graph shows a gradual increase in signal strength as the VGA is turned up, reaching something of a plateaux where, presumably, the base station starts telling the phone itself to reduce it&apos;s power output. A good quality external antenna arrangement is absolutely essential and the best cable, fittings and antenna should be selected. The cable should be rated to 0.3 dB loss per metre or better and the antenna should be a Yagi type with performance of 6dB or better. The antenna should be at least 20&apos; in the air, or higher depending on location, and should be pointed directly towards the nearest local 4G transmitter - this can be done by trial and error by swivelling the antenna around and monitoring the results on the SDR. This part is much easier - it&apos;s just a panel antenna and it can be mounted on a wall in a convenient location. I have a question about the Full duplex PCB, I am trying to figure out the layers. From what I understand top layer is the Radio singals, 2nd layer is ground, 3rd one is Control singals and last one (bottom) for Power. I guess 2nd layer is to prevent unwanted noise to the RF singal, including the yellow lines wrapping around all RF singals? Is this correct? Also do you know any place to order the duplexers from, I find it quite hard to find band 20 duplexers for sale, all I can find are those who needs to be soldered, I guess that not a big problem but I see people using bought duplexes all the time but no one want to share where they bought them. Hi there, I&apos;m the co-founder and CEO of RepeaterStore.com here in the US, and I was really excited to find this project! I&apos;ve actually thought about building something similar, but instead directed my SDR energy towards building a product that demodulates LTE signal and finds RSRP, RSRQ and SINR, as figuring out those numbers is really helpful for installing signal boosters. I&apos;d love to chat more with you about the project if you&apos;d be interested. We might even be willing to sponsor it, if that&apos;d be of interest :). My email is sina@repeaterstore.com - shoot me a note! How much for a kit? There&apos;s four Verizon towers in my area (I can find three of &apos;em on a map) and -- until I got a weird rare 4g home router that they sold for about six months back in 2013 -- I burnt through a MiFi a month. No, literally -- the signal is so weak here that winching it in caused the MiFis to burn out through thermal overload, roughly every three to four weeks. The router is now failing, but (oddly enough) it&apos;s the WiFi part that&apos;s dying, not the 4g part. (I bought a second router and wired it in to fix that. Easy peasy.) Somehow the PCI Express Mini Card (read: tablet or laptop type 4g card) modem is an order of magnitude more rugged than all those MiFis were... but I still need a special large antenna, in a particular window at a particular position, to get a half-decent signal. I get about 3g performance, maybe a smidge better, on their 4g network... at least, when they switched from 3g to 4g, I didn&apos;t notice much of a speed increase. Hello Starhawk ...... I could get a unit to you at &apos;cost&apos; price ie what it costs me if you would agree to test it for me in the USA? You&apos;d also need to find out what 4G band your phone works on with a software defined radio or such like. I&apos;m not sure if it will interfere with wifi or not, but rest assured, the filters I am using are very high spec so in theory there should be no conflict. Please send me a private message if you&apos;re interested in this proposal. Thanks! Under some circumstances a simpler and lower tech method may work. Take a small satellite dish and point it at the cell tower, placing the cell phone right where the signal will be strongest. This will allow the cell phone to both receive a much stronger signal and to broadcast back a stronger signal. Then connect a bluetooth hands free headset; which will give you the relative freedom to stand and sit somewhere comfortable. This solution obvious works best in a stationary environment and where line of sight is possible. Similar methods have been used with wifi to send signals over 100 miles. Yes simple is often best. Currently, as I write this reply, my phone is 20 feet up a pole hoisted up in a waterproof box like a flag. The USB cable connects to my computer and I have perfect 4G communication. Making / receiving phone calls is a PITA! If you take the phone outside it will try to receive from the base station and will also try and receive from the antenna inside the building. If the system is working properly it should be able to do this simultaneously, I think. Receiving from base station and from the inside antenna is all done on the same frequency. Transmitting from the phone and from the inside antenna is done on another close-by frequency and a good quality duplexer will provide a very sharp separation between the two frequencies mentioned above (Rx and Tx). This answer above is slightly simplified because the 2 frequencies mentioned are actually located in a vast bundle of frequencies that constitute the LTE band itself. I had to research what a duplexer really is.... The essence is that it allows Rx/Tx with one antenna. Probably obvious to most but it&apos;s something I didn&apos;t know. Since the inside-the-dwelling band is different than the outside-the-dwelling band what happens if you take the phone outside? Will it talk to the cell tower or try to talk to the outside antenna? Or try to talk to the inside antenna? You are about to report the project "Cell Phone 4G LTE Repeater / Booster / Femtocell", please tell us the reason.